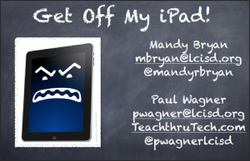 Wednesday, February 5, I attended a class on how to quickly pull assignments off of iPad. (Get Off My iPAD) I learned some things I did not know before and hope to share those with you here. In the process of writing this page, I have discovered that my iPad is locked by the configurator. I am going to have to go back to square one and forget this page ever happened. LEAVING IT UP FOR YOUR AMUSEMENT!!! In the meantime I will start looking into ways to get this fixed for next year.